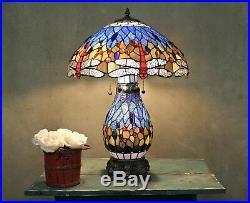 Add an amazing, functional piece of art to your home with this elegant Tiffany-style stained glass lamp. The hand-cut stained-glass base is illuminated with a 25-watt candelabra light bulb, and the lamp's look and style can be changed by choosing to use one or both of the lights under the lamp shade. Both bulbs have their own metal pull chain which complements the lamp's bronze tone base. Tiffany-style Dragonfly Table Lamp will be a stunning addition to your home decor. Dark blue shade with red dragonflies and with jewel accents. The color becomes super vibrant when lit. Base completed by cast metal with an elegant bronzetone finish. Measures 25 inches tall x 18 inches in diameter at shade. Requires 2 60-watt bulbs in shade. 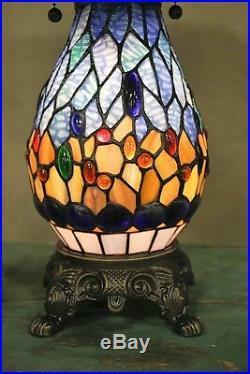 Lit stained glass base uses a 25-watt candelabra bulb. Colors on the shade are lighter and more vibrant when illuminated. 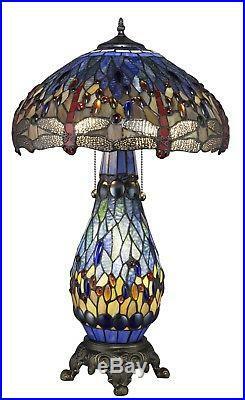 The item "Tiffany Style Dragonfly BlueTable Lamp WithIlluminated Base 18 Shade" is in sale since Thursday, November 22, 2018.